Influencer marketing helps you in a society that is distrustful of traditional advertising. Still confused as to why influencer marketing might just be the solution to all your problems? Consumers trust opinions they know as unbiased and influencers fit the bill. The recommendations they give are personalized. 84% of consumers believe trusted sources like family and friends, and influencers are part of this small group, because they take the time to connect with their audience. Influencer marketing is the fastest growing customer acquisition method (by 37% annually!). The influencer market was estimated to be worth $2 billion in 2017 and set to reach $10 billion by 2020. 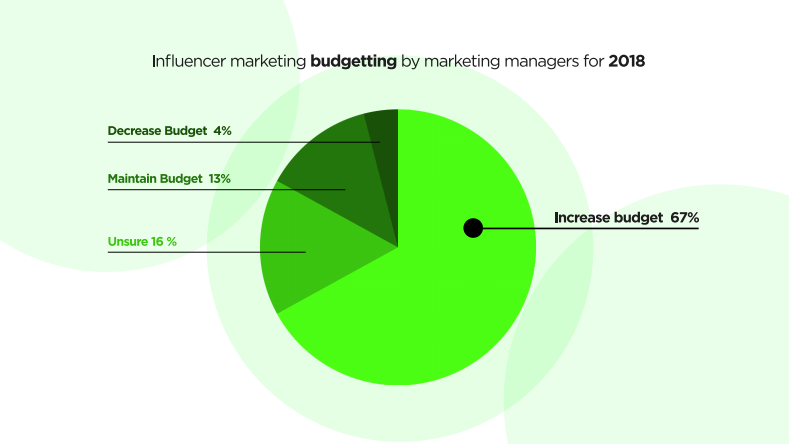 67% of marketing managers say that in 2018, they’ll increase their budget for influencer marketing. And that percentage could get even higher, as 16% is still unsure. Influencer marketing is a multifaceted discipline. It is not limited to a single department or agency. On the contrary, it benefits various professionals, departments and agencies. It is a useful tool in every part of your company. PR and advertising? Check! SEO? Check! Product development? Check! Social media? Double check! The importance of influencer marketing is still undervalued and misunderstood. This is your chance to get ahead of other brands and start with influencer marketing. Influencers have a certain impact over your target audience and they contribute valuable knowledge and insights for your business. It truly is all about nurturing relations: market with them, not at them. Influencer marketing is more than just telling an influencer to post an Instagram post about your brand. So. Much. More. Influencers are incredibly important for brands and if you do it right, they will give you a collaboration that could go on forever. Brands tend to only think about the first one when they start off with influencer marketing. They use influencers for brand awareness and want them to talk about new products. But there are so many more possibilities. Some of these influencers have been in the industry longer than you might be. They are more than just influencers, they are professionals who know a lot about their niche and the products in it. They can deliver precious feedback, and it would be a great idea to leverage them in more than just your marketing department. Influencers are creative people who often have a way with words. They create creative content anyway, so why not collaborate with them for your own content? Influencers know their audience, how to speak to them and what works for them. They’re authentic and their audience listens to them because they trust them. This is an amazing opportunity for brands to work with influencers and as part of the company instead of solely working with professionals.